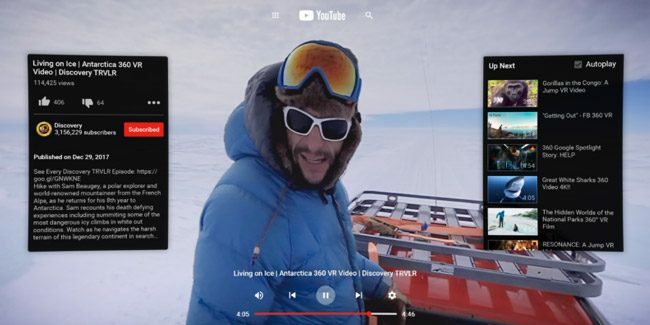 Oculus Go owners have been long-awaiting for the official YouTube VR app to make its way to headset after it was initially launched on Gear VR back in July, but now the wait is over. YouTube VR is available to download for free on the Oculus Store. The app offers Oculus Go users access to everything the video streaming platform has to offer, including its massive library of immersive, 3D 360° videos, as well as VR180° content, allowing viewers to watch and experience the videos as intended—rather than on a flat screen. Users will be able to login to their personal YouTube accounts to access their subscriptions, playlists, watch history, and pretty much every other feature offered on the standard desktop version. In addition, the app also includes voice search functionality to make it easier to discover content without having to type on a virtual keyboard. With more than 800,000 experiences available through the app, there is something here for everyone to watch and enjoy. YouTube VR is available for download now on the Oculus Go via the Oculus Store.